I never know how he finds these things, but a few days before National Pancake day, Nick sent me a link to an Icy Pancake Review. It seemed like an intriguing idea which I decided to save up for today, for you see, today is smack dab in the middle of National Pancake Week (yes, I'm sorry, but such a thing does exist). 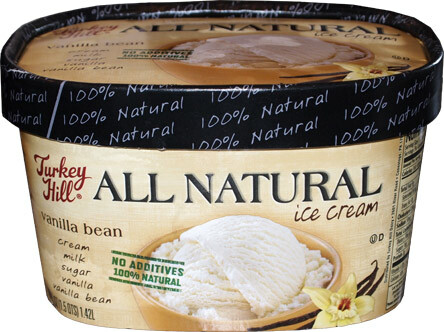 Now I don't have any strawberry ice cream, but I did pick up this lovely container of the freshly rebranded Turkey Hill All Natural Vanilla Ice Cream. I've always been a big fan of their all natural line, so it's good to see it get some attention and some new branding. Always dig a mix of classic and modern looks. Can you guess my favorite part of the packaging? It's the five ingredient list under the name of the ice cream (even listed in the proper order like they would be in the ingredients list). Granted, Haagen-Dazs did the same thing, but it's one of those little touches that helps sell an ice cream like this. 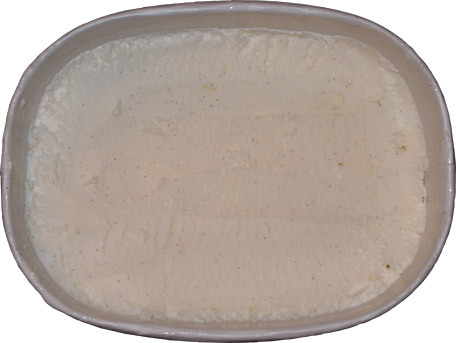 Now this one is all natural and full of vanilla bean flecks. Yeah, this one's a a winner. It's just a nice clean taste with an old school rigid texture that makes me feel like a kid again. It's not gummy or fake or airy or dense. 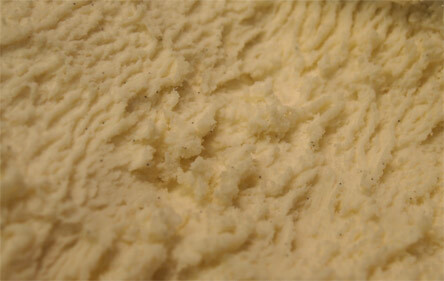 It's just plain and simple the way ice cream was meant to be. So ya ready for some experimenting? Now I don't know how it started, but when my daughter was young, she started eating all her Eggo products frozen. I don't know why, but it made her happy and it saved me cooking time, so we ran with it. With that positive reference in mind, I decided to break my experiment into two parts. First, we'll try a slab of ice cream between cold pancakes.... and that's a fail. Eggo pancakes are just too icy (crunchy) in the middle when uncooked. It really took away from my enjoyment. Ok, Hot Pancakes and ice cream go way better, my only regret it not going with like a chocolate chip pancake to really add some fun here (and maybe chocolate chip ice cream too?). It's pretty good, but it's not great. Ofcourse, you could always treat it like a breakfast treat and coat the vanilla ice cream with say.... brown sugar cinnamon? Sorry, love my crunchy sugar rush, but you get the idea, a little added texture would really finish this one off. Pancake Ice Cream Sandwich Verdict? Give it a try! On Second Scoop (sans pancakes): I've been trying to convince myself otherwise, but I gotta say, there is a subtle chalkiness to the texture of this ice cream. Someone had commented on the product guide that they believed Turkey Hill had messed with the formula and I said they weren't suppose to, but I can't help but think something is a little different here, though maybe it's just been too long. It's still a fine ice cream and I love the simple ingredients, but it (gently) reminds me of the dryness that plagued Haagen-Dazs Five. Maybe our modern society is spoiled by additives, and maybe most of you won't notice, but I have to say that I do notice just a little something. What the hell kind of ice cream reviewer are you? You gave turkey hill a free pass ? or didn't you notice what they did to their "rebranded vanilla ice cream? They added a littlemore cream, a little more air...and MUCH LESS VANILLA !!! The delicious vanilla bouquet and flavor is gone. It now taste like cookies and cream without the cookies...PUT BACK THE VANILLA TH! Ok, I realize deep down you are frustrated with Turkey Hill, not with me. A better way to have said this would have been "Dubba, I have their all natural line all the time and while you noticed something possibly off, I can guarantee you this has been changed for the worse".